As we celebrate the Araw ng Kagitingan on April 9, the KBO weekend is extended—from April 7 to 9. 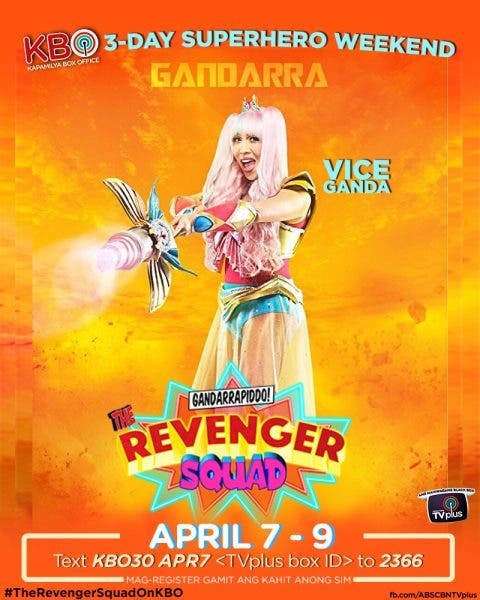 Follow Emy (Vice), a makeup reseller who is actually Gandarra, a superhero, who must remember who she is as she teams up with her siblings Rappido (Daniel Padilla) and Kweenie (Pia Wurtzbach) to form the Revenger Squad and save the world. The movie not only topped the 2017 Metro Manila Film Festival box office, it has also become the biggest Filipino movie of all time. It also marks the return of 2015 Miss Universe, Pia Wurtzbach, to acting. You may register using any prepaid or postpaid SIM. For prepaid, just load up (Globe, TM, Smart, Sun, TNT, or ABS-CBNmobile SIM) with P30; press the green / INFO button on your TVplus box remote to get your box ID; then text KBO30 APR7 to 2366. KathNiel’s First Kiss on TV, to Break the Internet?